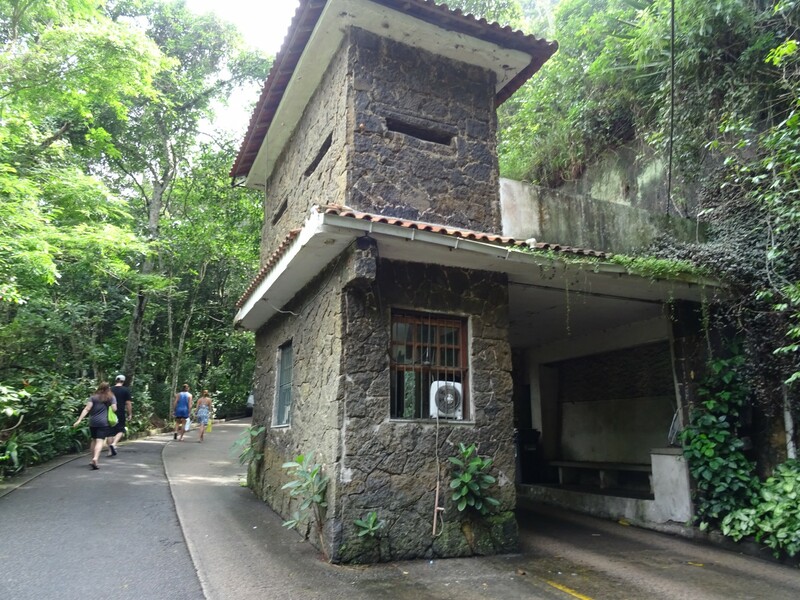 Saturday morning arrived – last saturday that is – and the five of us were up early to maybe avoid some of the crowds at Christ the Redeemer. It didn’t really work. We were at the base, where you can buy tickets for the tourist train, by nine o’clock, and we were still far too late. The next train we could get tickets for left for the top at 12:30. It seemed everyone else had also been checking the forecast; the weather had been miserable for days. Slightly disappointed, but not really fancying a 3hr+ wait, we got a minibus instead. An awkward system that included us changing bus several times, as each one sped a few hundred metres before coming to a halt, eventually got us, well, somewhere near the top. 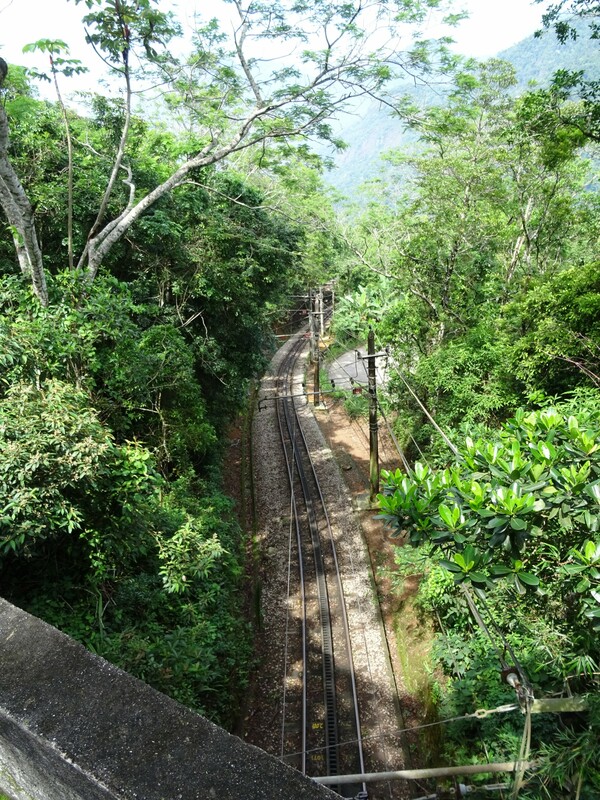 Ah, the railway we could have taken. If we’d have waited. Forever. Here, we queued up once more, for our entry tickets this time, and eventually came to the conclusion that with the mass of people waiting for yet more buses to the top, we might as well walk it. So we did. Joe and Hannah immediately sped off, leaving myself and Will bridging the gap to Tash’s, er, less enthusiastic pace. We got there though, eventually. Setting off to the top. I was immediately hit by a horrendous curveball though. My memory card was full on my camera. I only had 47 pictures on there, and I couldn’t figure out what the issue was – there should have been 8GB of space. I quickly, and luckily, managed to transfer some to my phone (a ballache of an act that I then had to perform periodically for the rest of the day), but I was annoyed at how unreasonable it was that the camera would spaz out right then. The feeling lasted. To set things straight, Christo himself is pretty awesome. 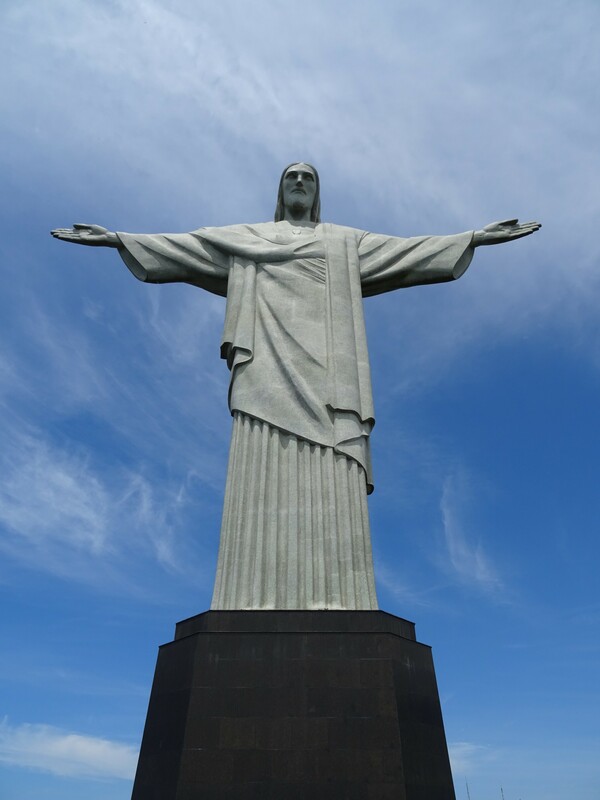 Iconic and imposing, you can see how he dominates Rio. The views, likewise, are incredible. 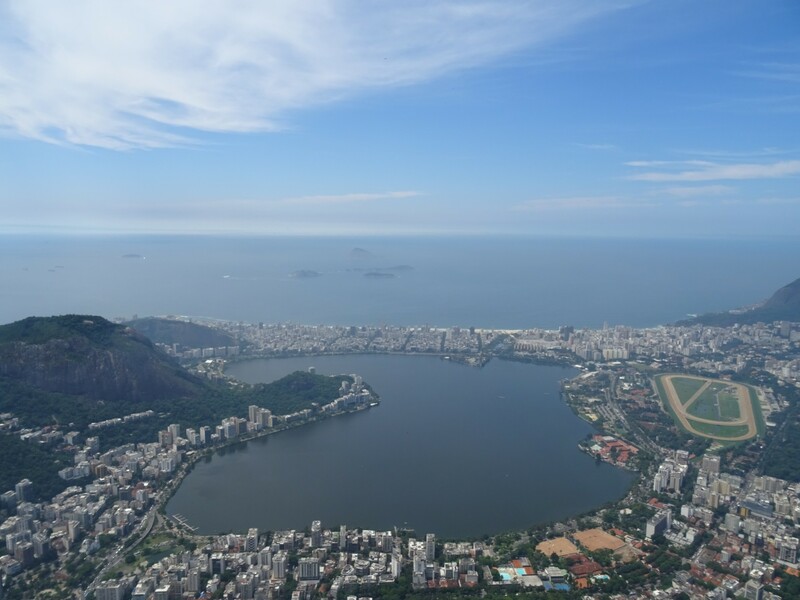 It was a beautiful day, so we could see for miles over Rio, the haze settling in over the edges of the frame. It was like looking at the miniature cities in Legoland, so pretty cool obviously. It’s Christo himself. So welcoming! The annoyance then wasn’t caused by the place, but by the people. Or more specifically, the selfie taking masses. It’s insanely crowded here, so there is never a chance of a clear shot of someone in front of Christo, or anything like that. That doesn’t stop people from taking 712 selfies each though. Or shouting at people to get out of their way. Or lying in the middle of the floor. Or even just pushing and elbowing you so their selfie is just right. One guy had a go at me for getting in the way of his selfie with Christo. His phone was on the floor, with the aim of taking a picture of both from below. I wanted to stamp on it. I knew I had to get out of there sharpish at that point, before I took it all out on the next selfie taker. After finding Will and Tash again (Joe and Hannah had gone to the beach), we descended once more. It wasn’t even 12:30 yet. These cool guys are hanging around by Christo. 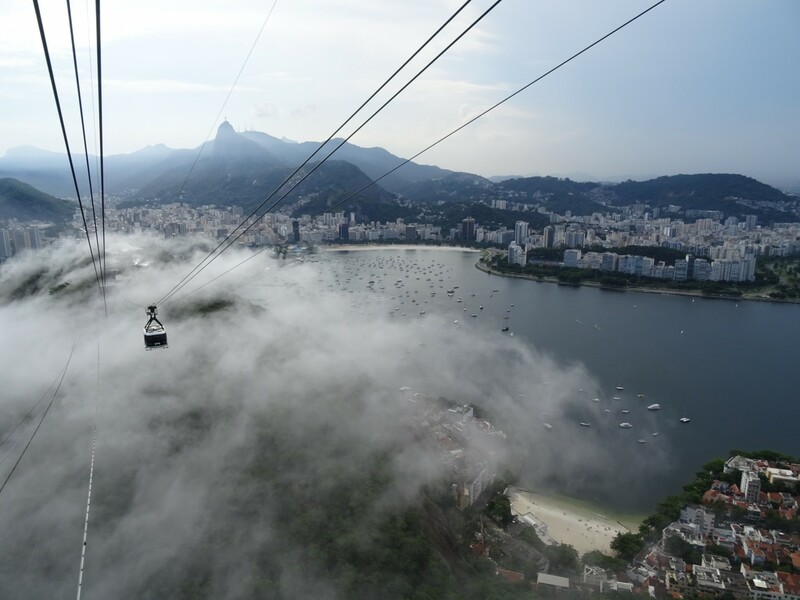 Tash and Will had gone to Sugarloaf Mountain the day before – not wanting to try and rush visiting that and Christo in the same day. Unfortunately, it had been totally shrouded in cloud – they had left having not seen more than five feet in front of their faces. 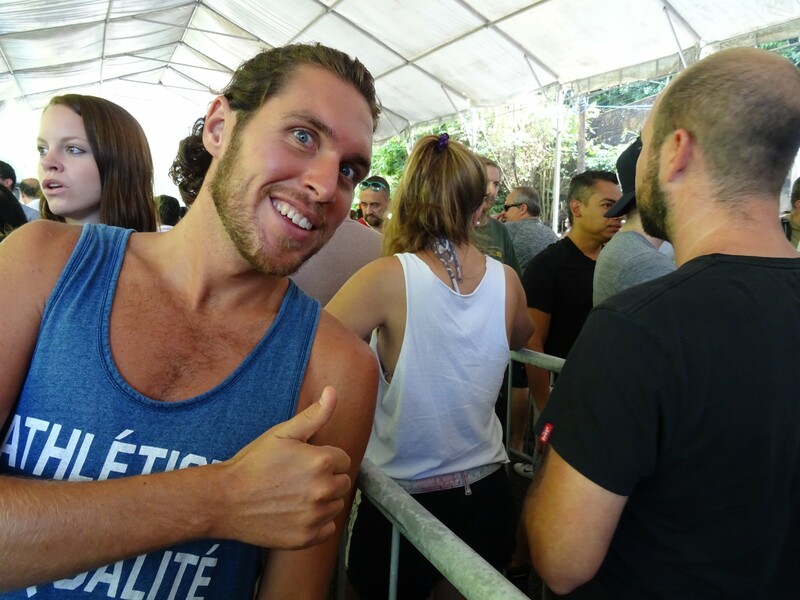 As we still had a good portion of the day left, we decided to give it another bash – one bus, one stop at a juice bar (still love them), one trip on the underground, and a bit of a trek later, and we reached the base. We were all pretty excited – Will and Tash because they could actually see the mountain now. Will had been given specific instructions to go here, before he left Australia, as his dad had travelled in the previous incarnation of the cable car, and his grandad the original cable car. The previous day’s shroud of cloud had been devastating – his dad had even said he wouldn’t talk to him until he had been up! I basically wanted to go because I remembered Roger Moore’s Bond fighting Jaws here. Maybe I should have called the trip “A venture to iconic Bond destinations”. Nevertheless, it’s always a worry that arrival at these destinations will result in disappointment. Sugarloaf Mountain, though, did not. 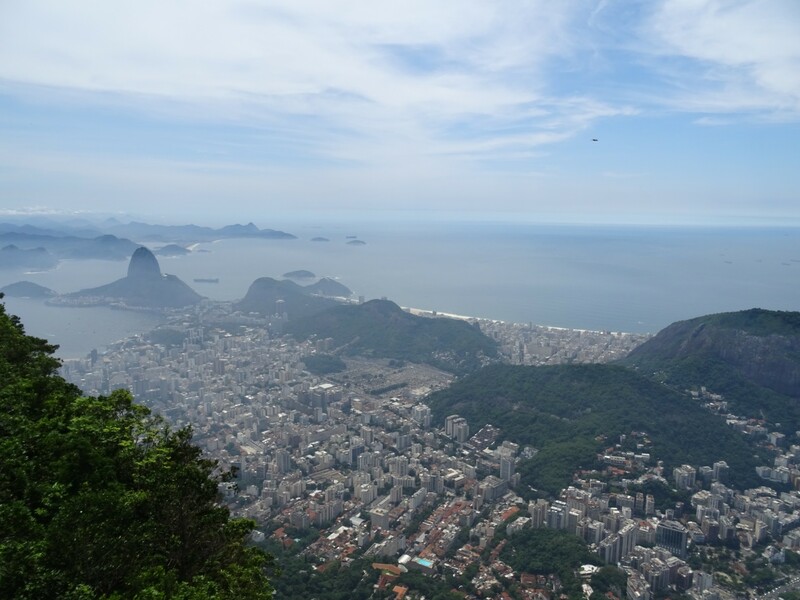 Arriving at the first ‘hump’, the views were amazing – the sort that are so iconic of Rio de Janeiro – the sort that really aren’t done justice in a photo. 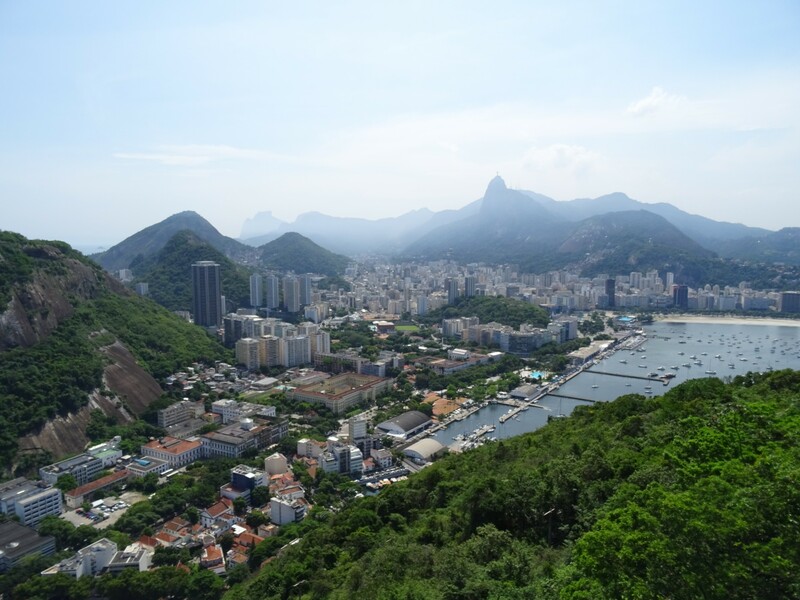 They’re all the better for the fact that you can make out all the individual buildings, and how the mountains divide and create all the areas of Rio. Clouds cap the idyllic islands spotted around the bays, as if they were hats on sleeping giants. You can see Christo in the distance. These clouds started to blow over as we took the gondola to the second, higher peak, but the views were still amazing. The three of us stayed for ages, just enjoying the serenity (while busy, it was much quieter than Christo) before it was time to come down. 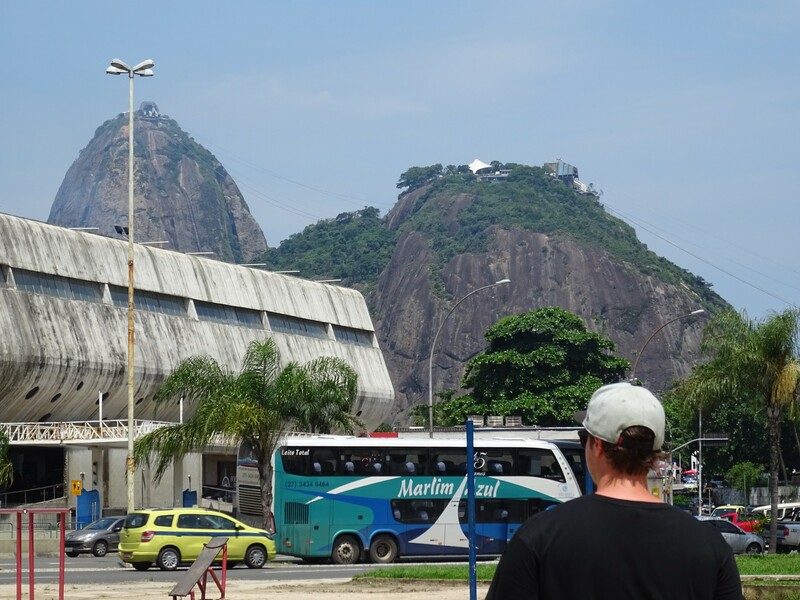 By the time we’d gotten back to the hostel we’d missed our bus stop and trekked through another area of town, so we felt like we’d seen half of Rio that day. I’d like to mention that this photo was A) Taken by Tash and not myself and it B) Involved no barging, yelling or lying on the floor whatsoever. 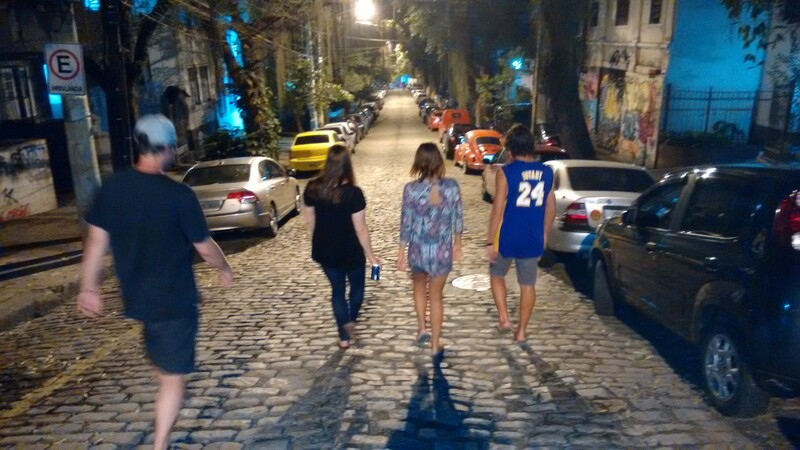 A bit more energy was yet required though – saturday night meant the stalls in Lapa were open – giant five reais caipirinhas all round! 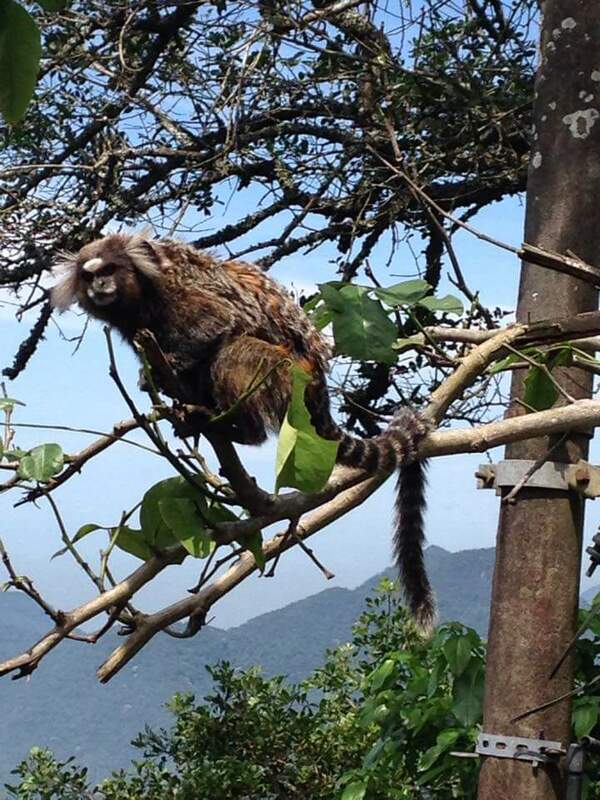 They certainly didn’t skimp on the cachaca either. A long day had taken its toll though, so we didn’t end up staying out too late. Midnight pizza was followed by almost immediate sleep. I woke up the next morning to a debate. Whether to go to the Maracana to watch Flamengo v Palmeiras, Flamengo being one of the most popular teams here (if not the most). I would have to go on my own, as no one else fancied it, and I was pretty tired myself, but I ended up going for it. I trekked over to the underground station and headed off. So, if Jaws was to start biting through the cable in front of your eyes, what would you do? It wasn’t as easy as that though. The Maracana is on the green line, but despite the fact that the green line trains supposedly travel up to where I was, they don’t. Only orange line ones. I found this out by waiting. Waiting, changing stations, waiting a bit more, asking an unhelpful woman and even listening to the underground announcements. They, indeed, suggested I could change lines at every station. 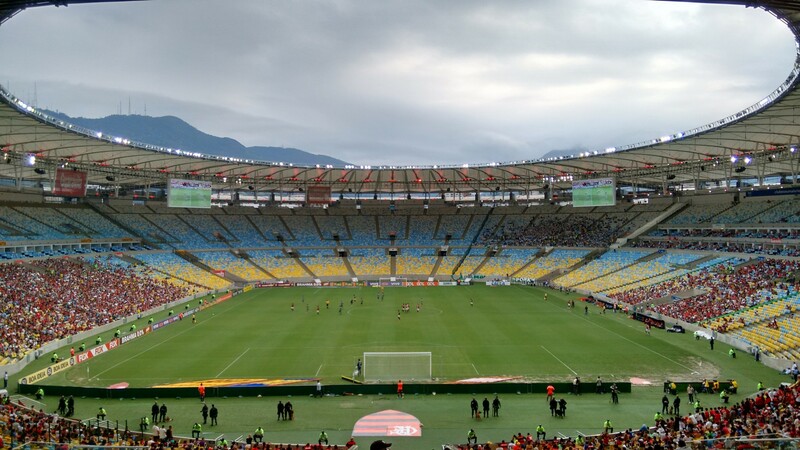 The Maracana, with almost nobody in it. Eventually I made my way further along the underground, following the now apparent hordes of Flamengo fans. By now I was late, which was not helped by the fact that tickets had to be bought over the other side of the stadium. I made it though, finally, and sat down behind the goal only thirty minutes late. I was lucky – it was still nil-nil. 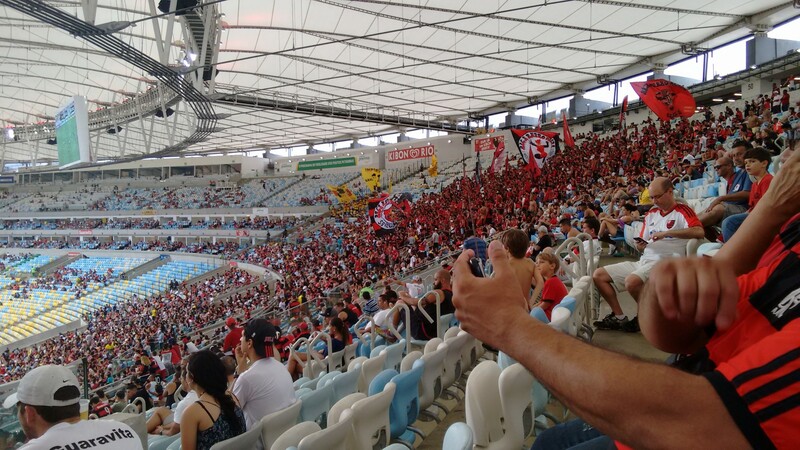 Disappointingly, Flamengo lost 2-1, despite the best effort of some sections of the crowd. The fans who were there were trying their best. 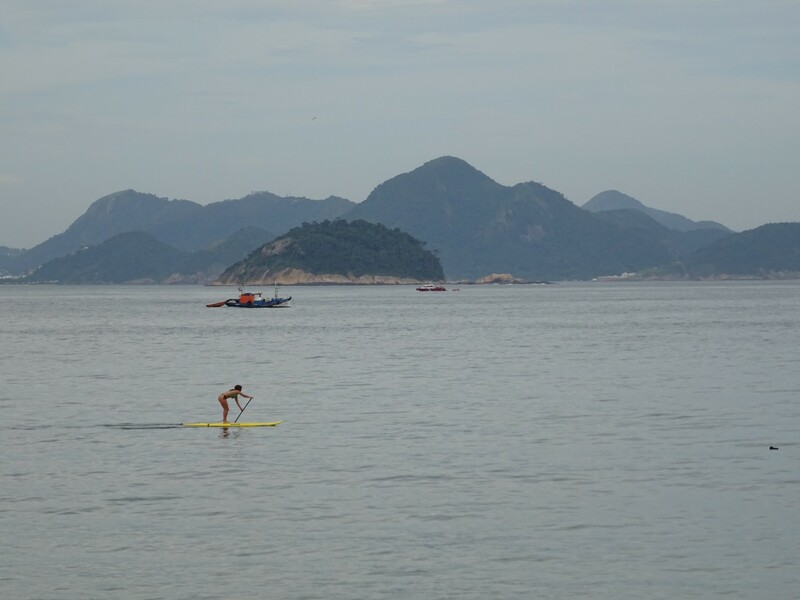 Steadily, everyone started to leave Rio after this. Tash and Will set off to Sao Paulo for a flight to the UK. Hannah and Joe left a couple of days later, having secured a flight instead. After introducing both couples (badly, obviously) it had turned out they were on the same flight to the UK. Coincidence? I was staring at the islands, honest! 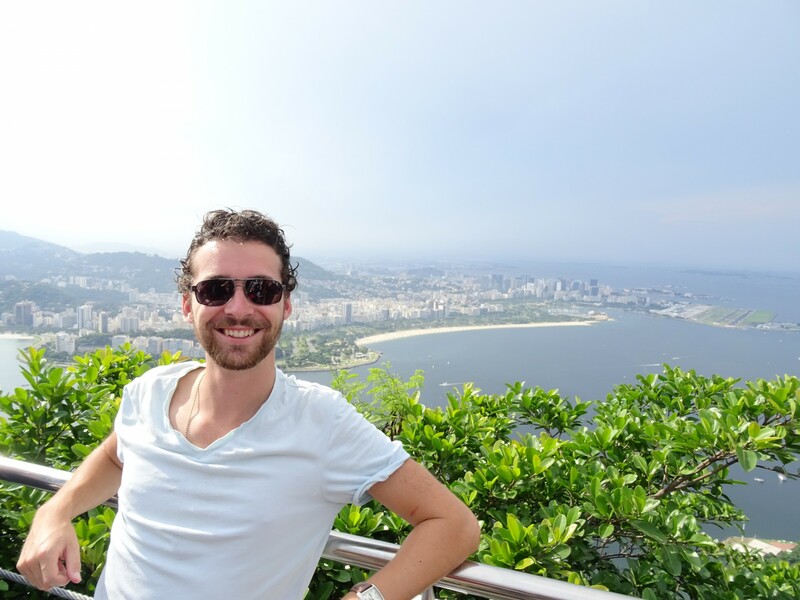 I lasted only a couple more days, busy fighting corrupt memory cards before choosing to buy some flash drives, and taking an obligatory stroll along Copacabana and Ipanema beaches, which I surprising hadn’t yet seen. They were ok. I did get two very important things done though. After a week of trying to sort it out with the guys at the post office, and three whole months of carrying my Manaus bought hammock around, I finally sent some stuff home. 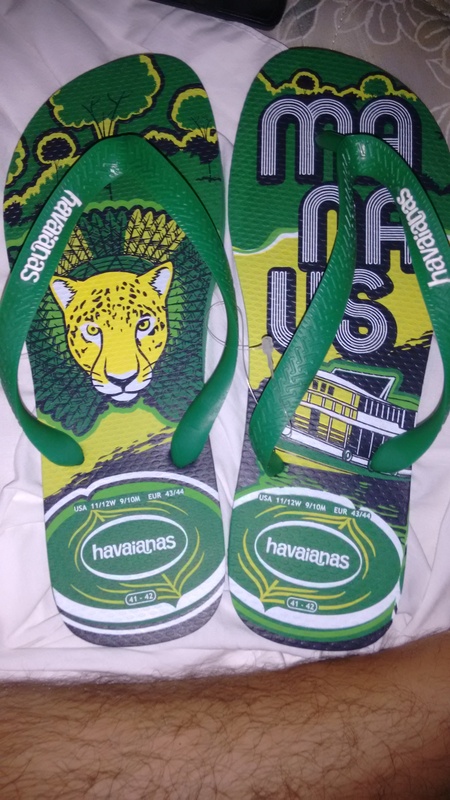 The second was buying a lovely colourful new pair of flip flops. Priorities, right? 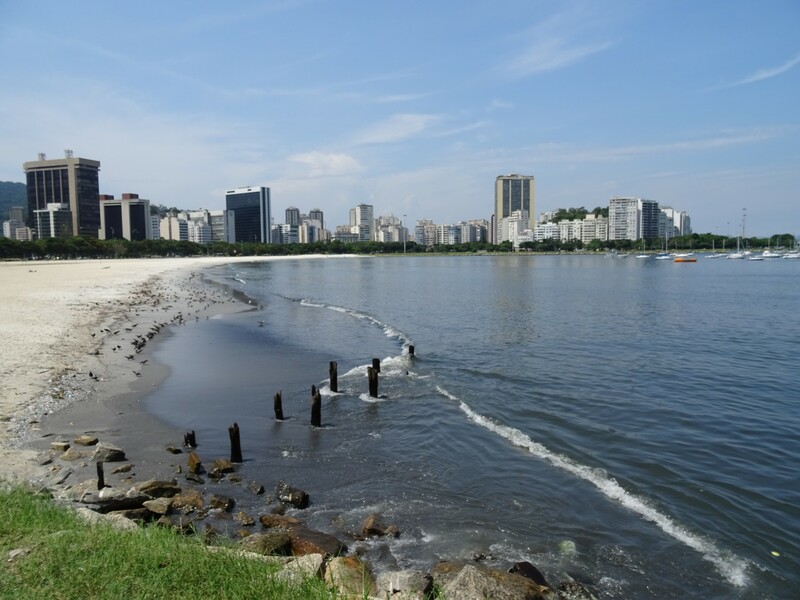 Beaches, Caipirinhas, City Exploration, December 2015, Football, James Bond, Spectacular Views. Bookmark.